But it seems like they don't pay attention to this forum. It seems like Facebook and Twitter are their platforms of choice, since they always end their wrap arounds with "Let us know what you think at TCM on Facebook or @TCM." How do we know anyone at TCM would listen to anything anyway? I just know TopBilled produced a really nice list, and it probably came off the top of his head in minutes. Should TCM steal his list, at least it will be some wonderful programming. Thanks Jimmy. I do think the programmers read these message boards. It is after all a site that TCM owns. Lots of good ideas here from lots of people. I think they realized after Dorothy Malone died how much she meant to people with the threads that were started in her honor, so she received a day in August this year. Are guests allowed to post again? I don't ever see this, unless Allanex has resurrected a 13-year-old thread. If you look at a post sagebrush made on page one of this thread, that person, whom sagebrush quoted, was jimmymac21. Not sure why his posts now appear as Guest. Maybe some sort of glitch? As far as the programming choices go, I've seen 12 of the 21 selected films previously, which is a larger percentage than I would like. I'm not a TCM Day-Oner, but I've been around for more than 15 years now, so I've definitely seen the same big-star, best-known films air a lot. However, a number of these films I've only seen once or twice before and won't mind seeing again. I'm a huge Gilda Radner fan and am happy she's included, though my initial thought was weren't there any actual Gilda movies they could show, rather than a TV special? But other than The Woman in Red and Haunted Honeymoon, I'm not sure how many movies she ever did. She didn't make a lot...and in all honesty, several of them weren't very good. She fared better on television. I think he asked the moderator to delete his account. He said he was leaving in the "Visit from the smartphone Spam fairy" thread. Thanks. I didn't see his comment there. I'm a little surprised not to see Barbara Stanwyck on the list. I know there's limited room, but I wonder if her skill as a dramatic actress overshadowed her great work in comedy in the minds of whoever compiled the list. Jean Arthur and Irene Dunne were similar cases, yet they made the list. I'm so happy to see Goldie Hawn among the more recent choices. She had a run of extremely entertaining comedies and Protocol is among her best. I also think Phillis Diller could safely have been left off to include something like Down and Out in Beverly Hills with Bette Midler. Even in her weakest films Bette herself was stellar. They could keep the ones they selected and add another night with other deserving honorees. I agree about Midler. 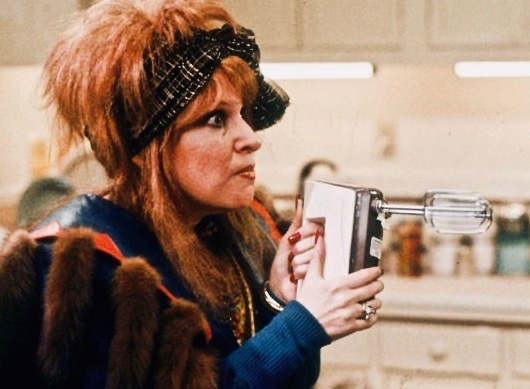 She's very funny in films like RUTHLESS PEOPLE and DOWN AND OUT IN BEVERLY HILLS. Carol Burnett is a good choice. Glad she agreed to do it. The more of these films I see, I can't help but wish the list included the character actresses as the focus in some of these films. Of course, they would have probably had to extend the salute to two days per week to fit them all in. I mentioned Alice Brady the other day. I think Eve Arden would have been a worthy tributee. Also, Helen Broderick and Spring Byington. I agree. There was no need to go with only the top star household names. Some of the character actresses are funnier than the lead actresses. Last Tuesday, both Alice Brady and Spring Byington were featured. I can't recall if Carol and Illeana mentioned them. This is a limited tribute in that the hosts only comment on the two film films shown around 'prime time'. I wish it was longer and that there was a day or two set aside for funny character actresses OR that the host had more time to comment on their contributions to the films being shown.